When natural gas is extracted from the ground, the chief component is "methane," or what we typically think of as natural gas used to heat homes. Other components include ethane, propane, pentane, hexane, heptane and butane that are in liquid form under high pressure, with most turning to a gas in normal atmospheric conditions. 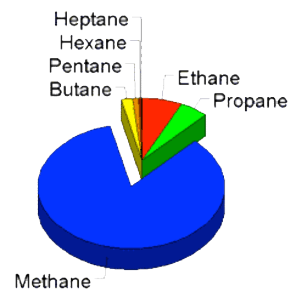 These are the wet gases that make up natural gas liquids. There are “wet” gas fields (a higher proportion of liquids) and “dry” gas fields (higher methane content), and lately production has been shifting to wet gas fields because of higher profit margins, since the price of methane is so low. Once the methane is removed, the remaining product needs to be “fractionated” or processed to separate out the individual gases that are used by petrochemical plants for making plastics, feedstock or fuel. Many of the NGL products in the Bluegrass Pipeline are intended for export. Read our blog updates on this campaign HERE. The proposed Bluegrass Hazardous Liquids Pipeline has been stopped by Kentuckians. The companies involved announced in April 2014 that they were suspending further investment because they lacked the customer commitment. However, they also found it impossible to buy their way through Kentucky, with landowner blocks holding firm in several counties. The companies had $95 million invested in project. The easements the company was able to buy in late 2013 and early 2014 are good for 3 years before they expire from inactivity, and could be sold to another company (although some have been terminated). 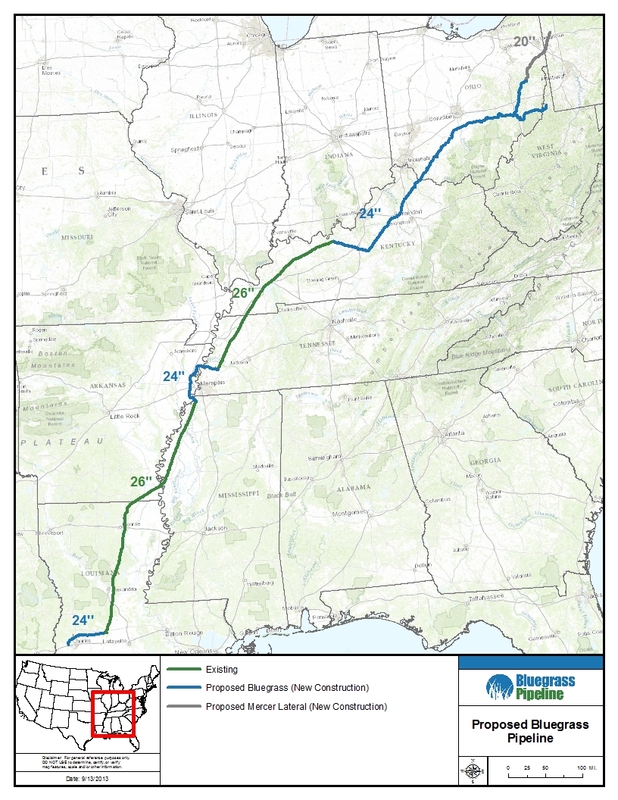 And though Texas Gas has withdrawn its request with FERC to repurpose the western Kentucky to Louisiana natural gas line, the original Bluegrass Pipeline project did not involve the Texas Gas line but rather new construction all the way through to Louisiana. This is still a possibility especially if another company were to buy the easements. More than a dozen Kentucky counties (see map) were within the possible path of the proposed Bluegrass Pipeline that would carry natural gas liquids from the fracking fields of Pennsylvania, West Virginia and Ohio to processing plants and export terminals along the Gulf Coast. 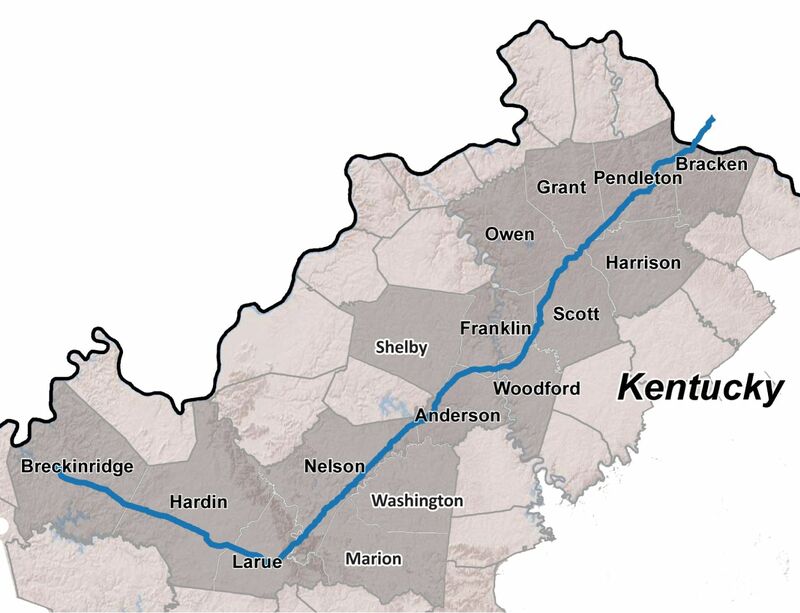 The 24-inch pipeline would enter Kentucky from Ohio about 30 miles east of Cincinnati and go in a southwesterly direction through central Kentucky before connecting with an existing pipeline in Breckinridge County that passes through another 10 western Kentucky counties. Company representatives were in Kentucky starting in Spring 2013 seeking permission to survey land. In October 2013 they began buying easements, offering unreasonable sums and pressuring landowners with quick-turnaround signing bonuses. They added to this pressure with an advertising blitz in local media, creating confusion about the product being transported and its potential economic impact. Despite company efforts, opposition to the pipeline was strong. 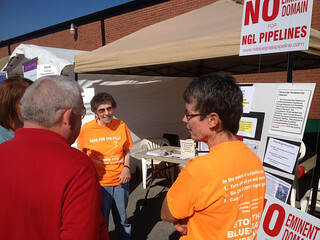 Local organizing efforts educated landowners about the true nature of the pipeline, the company's poor safety record, threats to regional water resources, the likely loss of property values and the many other reasons that any hazardous liquids pipeline is not in Kentucky's interest. 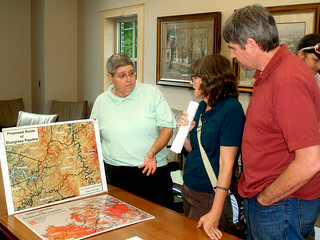 Many landowners who originally gave permission for surveys rescinded that permission after learning the whole story, and the company shifted its route several times attempting to find a way through Kentucky. Still, landowners are concerned about the condemnation of their land for this project and similar projects. The company maintains that it has eminent domain authority under Kentucky law even though in early 2014 Franklin Circuit Judge Phillip Shepherd ruled that pipeline companies serving no public use do not have eminent domain power. This ruling is now under appeal. Eminent domain likely will be an issue in the 2015 General Assembly (as it was in the 2014 session), especially since Judge Shepherd's ruling eliminated the special treatment oil and gas companies were given to condemn land for their gathering lines. 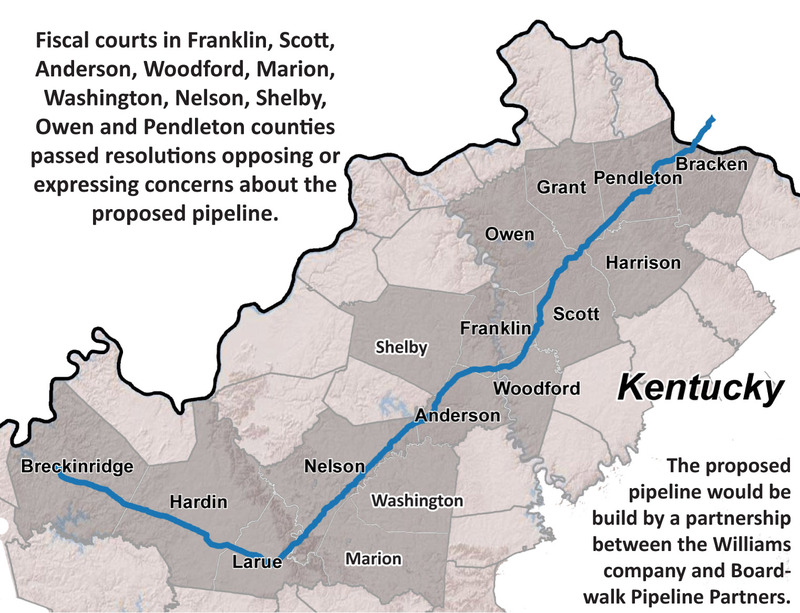 What is the Proposed Bluegrass Pipeline? Proposed new pipeline construction in Ky. Thanks to folks in counties along the route of the proposed pipeline who did most of the research for this page.